Join Our #discomania Virtual Blogger Party! Do you remember our virtual blogger party from July called #stripemania? I teamed up with my friend Igor and we brought you a really fun visual blogroll of sorts sharing all of our blogger friends in stripes in THIS Pinterest folder. We had over 300 submissions and it was truly an awesome gathering of bloggers in one fun space. This time I thought to team up with my friend, Steffi Luxat, to bring you #discomania! 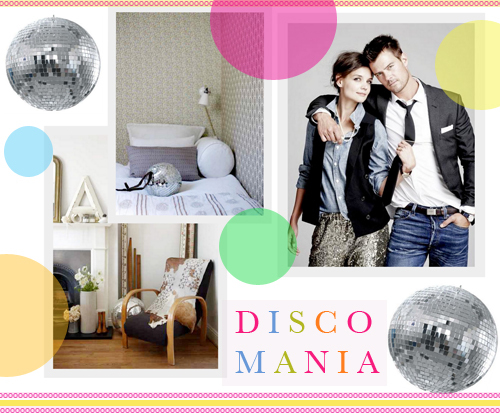 I tweeted about disco mania a few weeks ago but now it's official - we're hosting another blogger party and it starts NOW. It will be our way of uniting everyone to welcome 2012 looking good and celebrating our awesome community of bloggers and blog readers. Yay and amen to that! With so many of you getting all dolled up for tonight, why not show off your sparkles and sequins and submit your photo OR you can submit anytime between now and Monday, January 9th. There are no prizes as this is not a competition - it's just a fun way to gather a bunch of great friends in a single space to see everyone and have a chance to find new blogs and bloggers. 1. Take a self portrait (or have someone take your photo) of you either wearing something disco-ball like (sequined, shiny, silver, you get my drift...) or holding something fantastic that has to do with a disco ball (looks like one, IS one, etc.). 2. Have fun, be unique, show your personality and get creative. 3. The photo needs to show your entire face and at least part or all of your top half (not just your gorgeous face) so we can see what you are actually wearing or holding. It also needs to be current, so nothing older than a month — try to take the photo especially for #discomania if you can! More fun! 4. Upload the picture to this flickr group and include your name, location and blog URL beneath the photo. 5. NO TEXT on photos, please. 7. Once we see your photo, one of us will pin it to the Pinterest board with your blog name and link. 8. Tweet your pic anytime between now and January 9th. I'll give our big blogger party a shout out on decor8 and if you blog it, I'll retweet your post too so all of my readers can "meet you" - it will be fun to see all of my favorite bloggers out there again for another virtual blogger party. Much love to you guys and remember, disco fever! Go #discomania, go! End of Year Ritual: List Your Accomplishments!